The Sunpentown 46 Pint Dehumidifier (SD-46T) is designed to operate in smaller areas of the home up to a maximum of 300 sq ft (manufacturer's recommendation). It has a water extraction rate of 46 pints per day, is capable of low temperature operation and has an unusual air filtration system with greater sophistication than most others in its class. This is an attractive and compact unit that would be ideal for any home where floor space is limited. Perhaps the most interesting feature of the Sunpentown 46 Pint Dehumidifier is its unusually sophisticated air filtration system. Along with drying, the SD-46T filters the air in ways which reduce bacteria and mold spores. Inside the unit are an ultra-violet germicidal light and a titanium dioxide mesh filter. The UV light shines on the filter imparting the power to kill bacteria and spores. This is in addition to the standard air filter which removes larger particles, including some that are allergenic, and is washable. Finally there is a carbon filter that absorbs unpleasant odors. Taken together these three processes work to clean and purify the air. 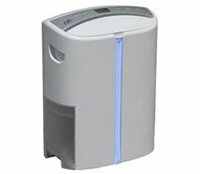 The Sunpentown 46 Pint Dehumidifier is quite compact with a depth of only 8 1/4 inches it has a small foot-print and will be easy to locate in an area where space is tight. Despite its powerful water extraction capacity the unit is also relatively light-weight at 27 1/2lb. With caster wheels and carrying handles it is truly portable and moving the unit should not be a challenge for the vast majority of people. In addition to its petite stature the SD-46T also has a small voice and is very quiet with a maximum noise output of only 45dB. All in all this discreet appliance should be a welcome house guest when excess moisture is a problem. Among the more common but nevertheless valuable features of the Sunpentown 46 Pint Dehumidifier is an adjustable humidistat which allows a preferred level of relative humidity to be set at 50, 60, 70 or 80%. This is an energy saving feature, avoiding unnecessary operation of the unit and maintains a level of relative humidity comfortable to live with and which safeguards your home. Emptying the water container is an easy operation but if it is not congenial or convenient the SD-46T is equipped for continuous drainage. Drainage is by means of a gravity feed, through a small hose attached to a discharge port and run to a convenient water outlet, a drain or sink. The water needs to travel down-hill so it may be helpful to raise the unit a foot or two to obtain best results. The Sunpentown 46 Pint Dehumidifier is primarily intended for use in rooms within the home but is also has an auto-defrost system enabling it to operate at low temperature, down to 41°. This means that it will be effective in a small basement area or in an unheated room at colder times of the year. Other features of the SD-46T include auto-restart to enable the unit to resume operation at your chosen settings after a power outage, electronic controls and two fan speeds.